No matter the occasion, whether it be a fancy dinner party or a weeknight meal at home with your family, one of these 12 DIY napkin rings will be perfect for your table setting. Enjoy a homecooked meal with simple leather napkin rings or a five-course feast with napkin rings that double as a menu. Bon ​Appetit! Roll up your cloth napkins and slip each one into a simple DIY leather napkin ring. These would look perfectly for a minimalist or casual dinner table setting. They're very durable, making them ideal for daily use. Remember Shrinky Dinks? This childhood toy has a sophisticated side when used to make these beautiful napkin rings that will dress up your dinner table for any occasion. Your guests won't believe you made these yourself! These luxurious DIY gold leather and marble monogrammed napkin rings are a clever way to personalize your table setting. Place each dinner guest's initial on a napkin ring to help everyone find their seat at the table. If you are looking for an easy and affordable napkin ring DIY for your table, this felt set is just what you need. Using felt in your favorite color and a small wooden dowel, you can get these done quickly over the weekend. A dinner party always feels fancier when there are fresh flowers on the table. While adding a few flowers to a vase in the center of your table is pretty, you can up the ante with this DIY. Use carnations or mums to create stunning floral napkin rings that your dinner guests will adore. No matter what your decorating style, wire napkin rings will work seamlessly with your table decor. You can make a set in either gold, copper or silver by getting wire at the hardware store and wrapping a loop large enough to fit around a rolled napkin ring. 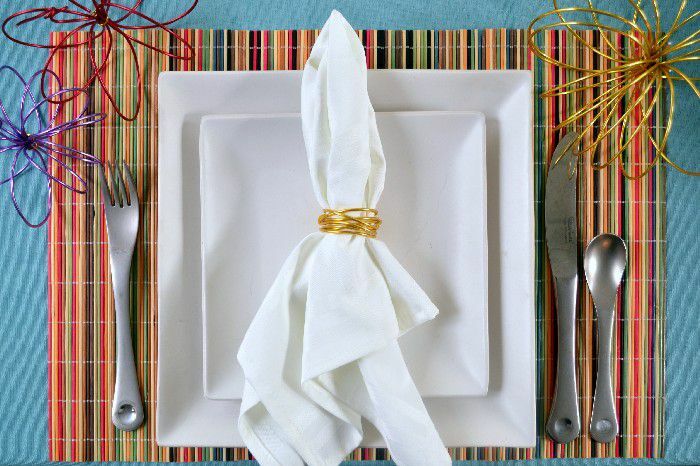 Make these twisted wire napkin rings to dress up your table or give as a hostess gift. This pretty but wire project is a simple way to spruce up your tablescape on any ordinary day. If you head into any home decor stores, you're bound to find beautiful ceramic napkin rings available for purchase, but often they are fairly expensive costing somewhere around $10-$15 a napkin ring, which quickly adds up when you have to set a table for 6 people. A great alternative to ceramic napkin rings is to sculpt faux ceramic napkin rings out of polymer clay by rolling the clay flat and wrapping it around a tube. To finish off this DIY, enhance with paint to make your napkin rings look like ceramic. Add a gorgeous pattern to your table with a super simple patterned napkin ring. You can make these with a free printable template. You can also download the template for the matching printable placemat to create a cohesive and cheerful table setting. When you are hosting a multi-course meal, let your guests or family members know what they will be served for each course with these lovely DIY menus that double as napkin rings. This simple project can be perfect by anyone at any skill level. It truly makes the table look extra spectacular and will help everyone get excited for the meal as they read what they are about to eat. For an everyday napkin ring set, try this DIY: String together wooden beads which you can further decorate by splattering them with paint.